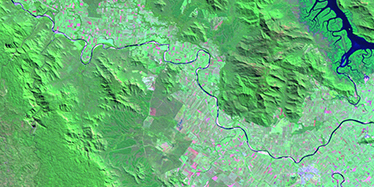 This Landsat image was supplied by the United States Geological Survey and processed by the Queensland Government Remote Sensing Centre. Satellite image of the Herbert River, Ingham on the left and the Hinchinbrook Channel off to the right in northern Queensland. Scientists in our remote sensing centre use data from satellites, airborne sensors and ground-based platforms to map and monitor Queensland’s landscape. They look at imagery of groundcover, land use, vegetation change, fire scars and water bodies across the state. The centre also undertakes leading-edge research to improve existing monitoring programs and develop new applications. Research is undertaken in partnership with universities, as well as other Australian and overseas agencies. What is remote sensing used for? the Great Barrier Reef Water Quality Protection Plan and Reef Protection Program. The wider community has increasingly recognised remote sensing as an extremely useful tool for resource management. Our imagery, maps and datasets are used for example by regional natural resource management groups, industry groups, research agencies and local government. Landholders are also using the imagery and digital datasets for planning, risk assessment and for their day-to-day decision making with regards to land management.